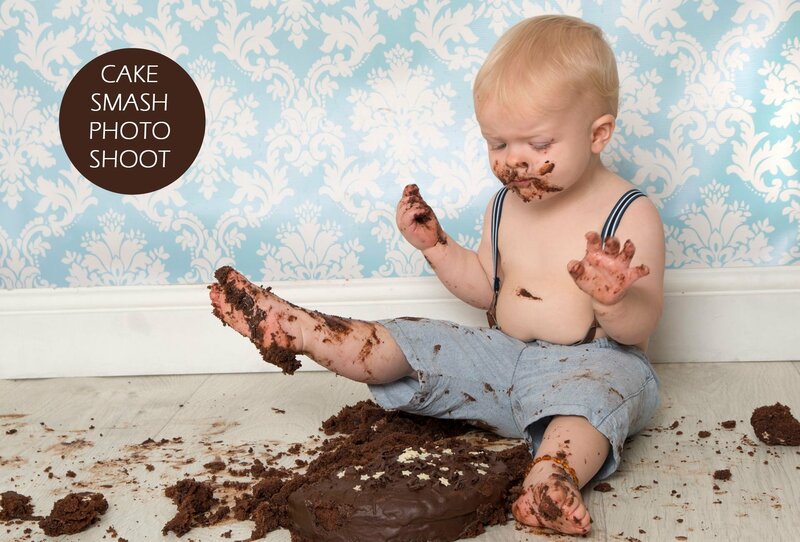 If you’re looking for a new, messy way to celebrate your little one’s birthday, why not book a Cake Smash Photo Session? It’s perfect for your little one’s first or second birthday and will ensure their birthday is remembered in a unique and exciting way! Each cake smash session is completely unique and will depend on your child! For most children it’s the first time they have come into hands-on contact with a cake so it takes a while to understand that they are allowed to make a mess and that the whole cake is for them! Some little ones totally smash the cake, others are just curious! The more inquisitive children apprehensively poke away at the cake looking at Mummy and Daddy for reassurance, and some just dive right in with feet, hands, face and all! We take photos of the cake and your child before the smash, during and afterwards. The expressions are priceless! You can dress your little one in any outfit you choose but remember it will get messy! Popular outfits are a pair of dungarees, a tutu, a nappy, frilly knickers, a printed T-shirt with the baby's age printed on the front, or a classic party dress. Colourful accessories also work well, such as hair bands, hats, caps and costume jewellery. You will also need to bring a change of clothes for your little one, as after the cake smash they will be messy! We don’t supply the cake so you must remember to bring a cake with you. Giant cupcakes work really well and it’s better to choose one with coloured icing as it shows up well in the photos. You might find it useful to bring some baby wipes and a towel with you. It’s also a good idea to bring any comforters and your little one’s favourite toy. 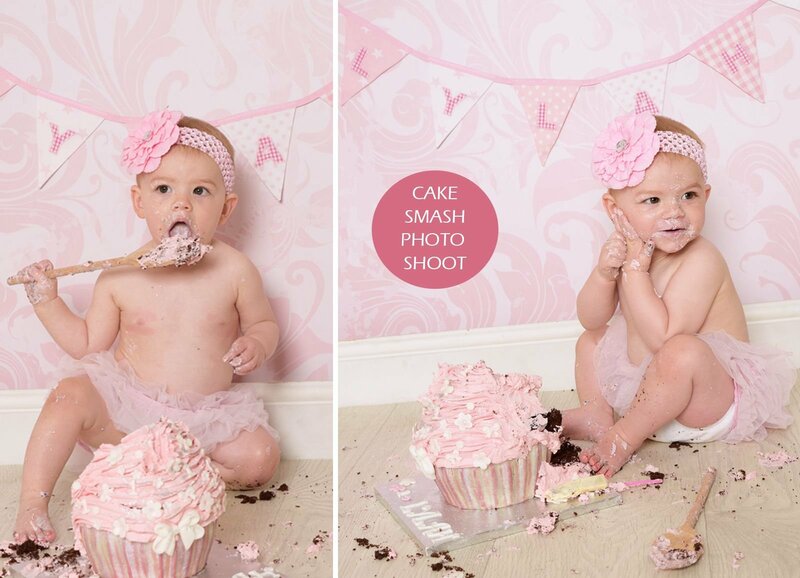 To book a cake smash photo session please call us on 01234 363914, or 01234 262609. Or book online using the link below. We require full payment at the time of booking. It’s definitely best to schedule the session during your little one’s best time of day; e.g. first thing in the morning or later in the afternoon after a nap. The photo shoot doesn’t have to take place on the actual day of your childs birthday it can be before or after. Our cake smash photo sessions are very popular so please make sure you book early to secure the day you would like to come in. 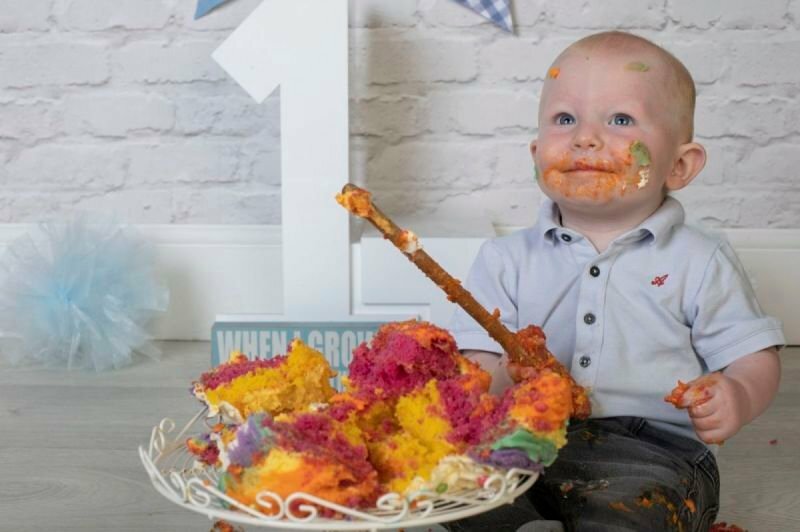 If you need to change the date of your cake smash photo shoot we require 24 hours notice by calling us on 01234 363914, or 01234 262609 and speaking to a member of staff. If you do not show up for your booking and have not contacted us you will NOT be entitled to a refund.